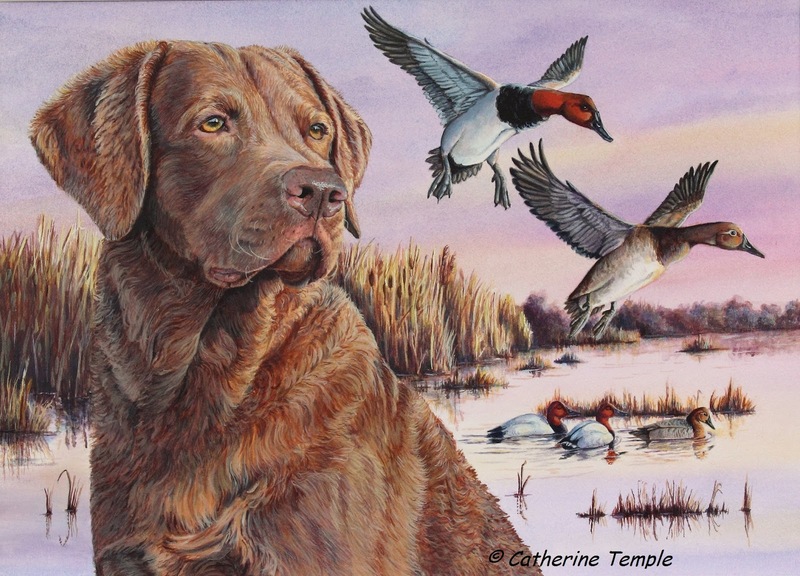 Catherine Temple: Winner 2017 Delaware Duck Stamp Competition! It's official! My painting of a Chesapeake Bay retriever and canvasback ducks is the winner for the 2017/2018 Delaware Duck Stamp! The judging took place last Thursday, April 14, and I was notified that afternoon. When the phone call came I almost couldn't answer it. I looked at the caller i.d. and couldn't believe they were actually calling my number! I am humbled and honored beyond words that my painting was chosen from 13 entries to receive this award. And I am thankful for all the people who prayed for me, encouraged me and helped me with reference photos to complete this painting. I didn't do this on my own. Not only did I have the support of my awesome husband, my family and great friends, but I feel God lent me his paintbox and moved my hand to create this piece. There's no other way I could have come up with the idea and some of the colors I mixed. I owe a great deal to you all! 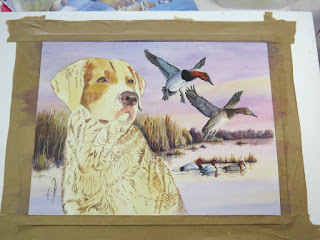 And thanks to the team of folks in Delaware who selected my painting for their duck stamp! The painting is now on display with the other entries at the Bombay Hook National Wildlife refuge until the end of the month. After that it will go to the printers to have the stamps and the 2000+ prints made that I will be required to sign and number. The stamps will be available in July 2017. A few weeks ago I posted a sneak peek at a painting I was working on for a competition. I can now reveal that piece as the deadline is past and the artwork is safely in the hands of the Delaware Division of Fish and Wildlife. For the next few years the waterfowl stamp for the state of Delaware will feature a specific retriever breed and a specific duck. This year it was a Chesapeake Bay Retriever with the Canvasback duck. Since I own a Chessie I felt it was a competition that I had to try for. I started this project months ago. 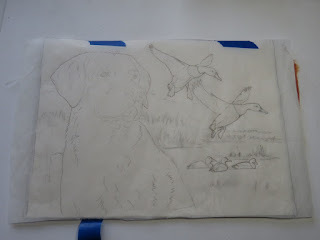 It took some time to come up with a basic concept, then I had to find photo references for the dog, ducks and background. I photographed sunrises from our duck blind and set up photo shoots with my dog, Balin, trying to get just the right pose in just the right light for my idea. This was a challenge on many fronts, but trying to get him to sit still and look dignified while near any kind of water usually resulted in me being pelted by sand, mud and water when he'd had enough of that nonsense and broke from his "sit and stay" to rampage wildly along the rivers edge. 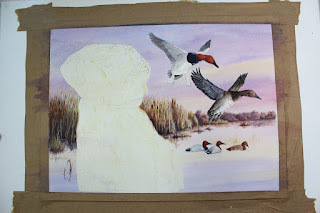 The canvasback ducks were also a challenge because we don't get many of them passing through our area. I had some photos, but thankfully, I have talented friends who love bird watching and photography and could help me out with the reference I needed. 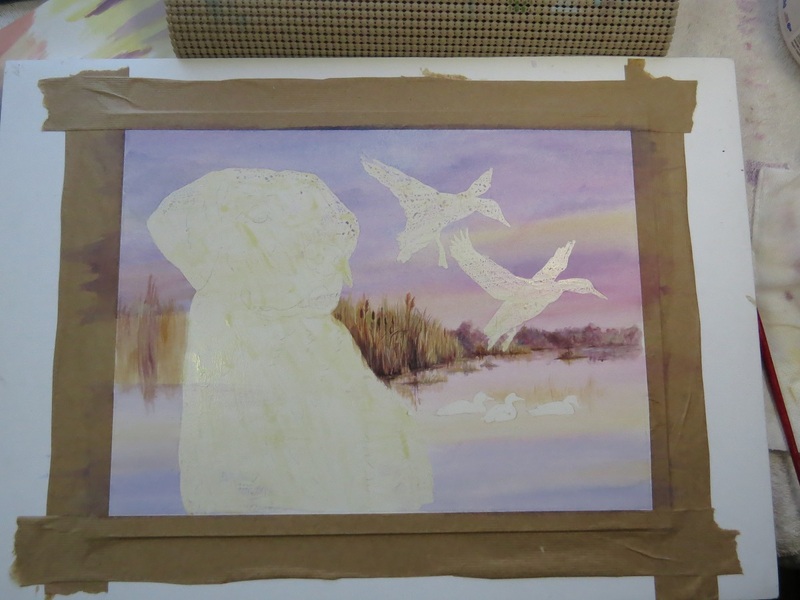 After all the reference was gathered and composition complete, the painting was transferred to a board and the first washes laid down. It took me three tries to get the sky and water to work. I had a slightly different concept in mind, but every time I painted it, it came out the same. Apparently, this was the color it wanted to be so I finally gave up and went with it. 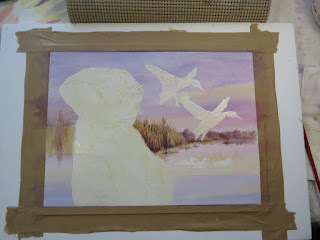 I seemed to agonize over each stage of the painting. The landscape was particularly challenging for me as I'm not a landscape painter and this had to represent a Delaware shoreline. Also all of my reference photos came from different places with different lighting in each. I had to be very careful to make all of the elements in the painting appear to be lit by a single light source that depicted the soft glow of first light over a quiet marsh. After numerous hours spent on the rest of the painting I was finally able to get to the part I liked best....painting the dog. I had been successful in my earlier photo shoots with Balin and had managed to come up with a pose that I thought captured the drive and intensity that this breed exhibits in the duck blind. I also wanted to capture the handsome ruggedness of the breed that other Chessie owners would recognize at once. In my opinion, many paintings of this breed do not capture the true personality and conformation of the Chesapeake. They come off looking like an odd version of a Lab and a Lab they are not. 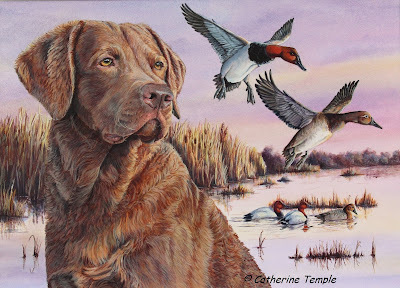 I wanted to be sure this dog captured the Chesapeake solidly, so I spent a great deal of time getting the right photo for the pose and painting the eye color and coat texture that is characteristic of this breed carefully. Now comes the hardest part of all, waiting for the end of this story. The judging for this contest does not take place until April 14th. I have no idea who the other contestants might be, but most competitors for the state and federal duck stamp competitions are exceptional artists. That in itself was almost enough to scare me off, but I will never have any chance if I never try. So I've given it my best effort and now wait anxiously for the results. Catherine congratulations on this prestigious award for your wonderful painting. And so great that this is your dogs portraits! Thank you for sharing the steps of your process and experience. And again, CONGRATULATIONS! Thank you, Peggy! So glad you are enjoying the posts.